Ideafly Grasshopper F210 may look like a toy, but be warned, it is not a toy! With a design that looks like a flying insect, the Grasshopper drone could almost be called cute. But despite its whimsical appearance as a friendly grasshopper, this quad is a serious racing machine. Why? First of all, it takes a 4S battery, which means that is has a ton of power. Second, if you choose to buy an upgraded 75C battery, the Ideafly Grasshopper F210 Racing RC Quadcopter will go almost 140 miles per hour. This is pretty insane for a sub $300 ready to fly quadcopter! If you are looking for a FPV racing quadcopter that can hang with the big boys and stand out from the crowd, then the Grasshopper may be just the drone for you! The first thing you will notice about this quad is the design. It really is clever and well thought out. The frame is a standard “x” configuration, but there is a raised area that protects the FPV camera and forms the head of the grasshopper. There are LED lights in the grasshopper’s eyes that light up when you power it on. There are two antennas that stick up from the head, mimicking a real insect. And the quad’s frame has a yellow plastic piece that lifts up to hide the battery and major components as well as protect them from damage during crashes. The overall effect is a drone that looks a lot like a grasshopper! However, you should not let its clever disguise fool you. The components in this quad are pretty high quality for a drone that falls in the under $300 USD price range. It uses the F3 10DOF flight controller. It also has four 2300 kv motors that will really get up and go! You can get it as a ARF (almost ready to fly) or RTF (ready to fly) model. The RTF includes a cheap but decent transmitter with few bells and whistles. Generally, it’s a pretty well built copter for the price! The Grasshopper is pretty well designed and built. It feels a bit heavy for its size, but I attribute that to the large 4S battery and the extra protection built onto the frame for the FPV camera and battery. The propellers go on with prop nuts, which require some work to tighten down properly. One small issue I had was that it does not come with a driver for the prop nuts, which means you will need to provide your own. Believe me, you can’t get enough torque tightening the props down by hand, so you will need the driver. Luckily I had one lying around from another quadcopter. The plastic parts are well joined to the carbon fiber and metal parts, so the whole thing feels like it’s going to hold together quite well. The only part that has broken on mine so far (after about 10 flights) is one of the feet broke during a particularly hard landing. The option in the case of one broken foot is to try to rig something new to that spot or just pull off the remaining three feet so that it sits evenly on the ground. I chose option two and ripped of the three remaining feet. This didn’t adversely affect its flight at all. And while the radio that comes with the RTF (ready to fly) version seems a bit cheap, it does come with a nice zipper case to carry the drone in, which is a very nice touch from Ideafly! The RTF Grasshopper comes with the radio already bound to the quadcopter. So your first step is just to charge the included battery and turn everything on. As I mentioned above, you must be sure to secure the propellers tightly. On my first flight, I had one loose propeller and the quad flipped upside down immediately because it was not getting lift from that prop! Once you have the props on nice and tight, it’s pretty easy to get into the air. Be sure you plug it in on a level surface and have your transmitter turned on when you plug it in. Also, be sure you are not in Acro (advanced) mode when you plug it in and take it up for the first time. 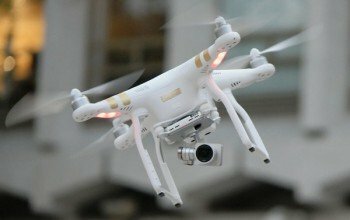 It has a lot of power, so you’ll want to start with as much assistance from the flight controller as you can get on your first flight. Once in the air, it hovers nicely and is no harder to fly than any other FPV racing quad in its size range. But, as I’ve mentioned before, you will definitely want to be sure to go easy on the throttle the first few flights because it can travel a long distance very quickly. One other note is that the FPV camera is connected to a 200 mW 5.8 Ghz transmitter. This gives it decent range if you are flying in an open field, but does cause some video breakup when you fly through trees, around buildings, etc. Be aware of that and take your first flight in a nice open area without anything between you and your Grasshopper! The Grasshopper is fun to fly. It has plenty of power and is very responsive. The biggest thing I have found it that the transmitter for this quadcopter is more sensitive than most others that I have used, so a little goes a long way when it comes to throttle and turning. Be sure to hover a bit first to get used to the controls before you go flying full speed around the track. It is also a fairly heavy quadcopter for its size, so it takes a bit more room to turn than other lighter quads in this category. One thing that I tried was to see if you could fly it with a 3S battery to “tone it down” a bit. When I put the 3S battery on it, the reaction was that while everything would fire up, the props would not spin fast enough to get it off the ground, so you will definitely need 4S batteries to get this guy off the ground! The Ideafly Grasshopper F210 is a unique quadcopter. It looks like a toy, but I would not buy this as my first FPV racer because it is pretty powerful and can get away from you easily. You should only buy this if you are an experienced pilot. It has some really nice features like the LEDs and the carrying case that comes with it, but it also has some drawbacks like the cheap radio and feet that seem to break somewhat easily. I would say that it’s a fun and challenging FPV racer for someone who is looking for something different to fly and stand out from the crowd. It’s not a beginner’s quad, but the Grasshopper is certainly worth considering if you want to get a “jump” on the competition in both speed and style! Crazy fast with a 4S battery and even faster if you get a 75C 4S battery!